We are well underway in the process of ‘Becoming Fools’! Clowning is a performance art. It’s experiential. It’s theatre. And … it’s cathartic. Clowning can help these kids process their tragic stories and better understand their wounds. Clowning can also empower these kids to begin to communicate their stories non-verbally – in a way that crosses culture and language – so that we the audience can begin to understand their needs and respond. Both the clown and the audience have the opportunity to heal. Classes are now in full swing every Tuesday and Thursday. In these training sessions, kids are learning and perfecting a variety of skills included in clowning and in theatrical performance. After each class the kids are tasked with specific skills and exercises to continue practicing at home. How fun it has been to watch the kids being creative, being silly, expressing themselves, and improving their skills!! At times, it may seem that a theatrical performance at such a big scale may be a goal that is unachievable. But the kids involved in this project are extremely talented. And these kids are passionate about influencing people around them in a similar way that Italo inspired them. “My dream is leaving the streets for good and being able to have myself a small business to have a training shop – workshops with makeup and stuff like that. And help people that are in need like I am need right now,” Byron says. “That is part of my dream, to become an artist, a great artist like himself. I like to bring joy to people’s lives, and I like to see people laughing. My purpose is to bring joy and happiness to people, to bring a moment of joy to others, a moment of entertainment, a moment in which they can clear their minds,” Mefi shares. The kids have been practicing skills like improvisation, vocal coordination and projection, facial expressions and exaggeration, stage directions, dramatization, the art of applying make-up and everything in between. All the while embracing a stronger understanding of self-confidence. Throughout the process of preparing for the Becoming Fools Live Event, these kids are given a goal to work towards, something to practice and thus a very tangible way to see their skills and themselves grow. We have a long road ahead of us, but the kids are enjoying the ride and so are we!! We have secured Teatro Abril as the venue for our live clowning event this June, and we couldn’t be more excited! Teatro Abril is one of the most historic and celebrated theaters in Guatemala City, known for its amazing charm. 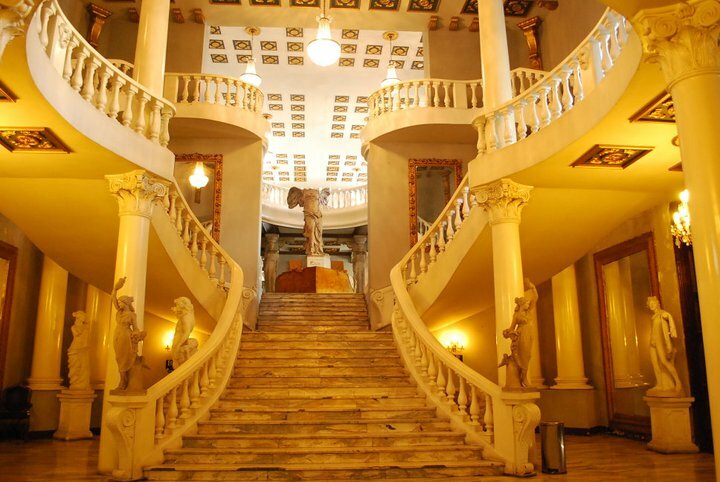 Marble floors, spiraling staircases, ornate European-inspired statues and beautiful chandeliers fill the lobby of Teatro Abril to create a breath-taking entrance. These elements give the theater a sophisticated charm that inspires and represents Guatemalan culture. The exceptional attention to detail in the design of Teatro Abril continues into many salons located throughout the theater. It is estimated that over 50,000 people attend events at Teatro Abril each year. The theater is located off the lobby through a large, golden curtain. It comfortably seats 700 people on the main level and two balcony level seats. The carpet and seats are a beautiful red fabric that gives the space color and continue the character of Teatro Abril. Take a min to look at some more pictures at: http://teatroabril.com/. We will keep you updated and look forward to sharing the live event with you in months to come. On Wednesday night the team met at Joel Van Dyke’s House in Guatemala City along with our Guatemalan friends who have given so much of their time, passion, and effort towards preparing for the premiers this week. I was overwhelmed by the hope they have that this message could make a real difference for their country. Everyone who has been a part of this film has such a sense that God crafted the story and the results are all to his glory. Now we are all just standing back in awe as God takes his message to the people. Again, all of our showings are full and frequent calls are still coming in of people who want to see the film. But beyond the numbers, we are hearing stories of how hearts are truly being awakened and a passion is forming to serve God’s people like never before. I include myself in these numbers. So far this week we led an art camp for students near Antigua who have had little exposure to the idea of creative expression. It was amazing to see their joy as they realized a talent that they never knew they had, or to see them express their thoughts about themselves, their family, and God, some for the very first time. This idea that they can see God in the small things, that trash can be something beautiful, that they have the potential to dream and to “ask beautiful questions” is a brand new concept to so many of them. The teachers, who participated in the classes along with their students, seemed equally inspired and wish to continue the art program in their school. We have also visited some extremely poor communities and walked with people who are giving their lives away to bring hope to these families. We interviewed a pastor (Mario, above) who was born and raised in the same hill town where he now serves. God reached him through powerful visions and some missionaries who came to work and serve in the community years ago. He then took us to meet some families who have been given a chance to provide for their families through a microfinance project, allowing them to borrow money in order to purchase chickens or other livestock so that they will have products to sell. These families were so thankful for the little that they had, and they thanked us for coming to their village to share in their stories. All we could do is hug them and smile and tell them in our broken Spanish how we were thankful too. God truly does use the weak to shame the wise. God’s heart is for the poor. “Blessed are the poor” is not only those who are poor in spirit. God truly dwells with those who are in need and as Tita says in the film, God is “tangible” in these places. In trying to process all that we have encountered this week, I know I have to respond. All I can do is tell God I am standing here with open hands and trust that he will tell me how. It seems that our involvement in this film is just the first step. To God be the glory.